Hickory Hollow Resort requested a complete redesign of a poorly performing site. We worked with soft nature colors and used a huge number of photos to show the beauty of the resort. The hosts are so very friendly and welcoming that they have visitors who return every year. 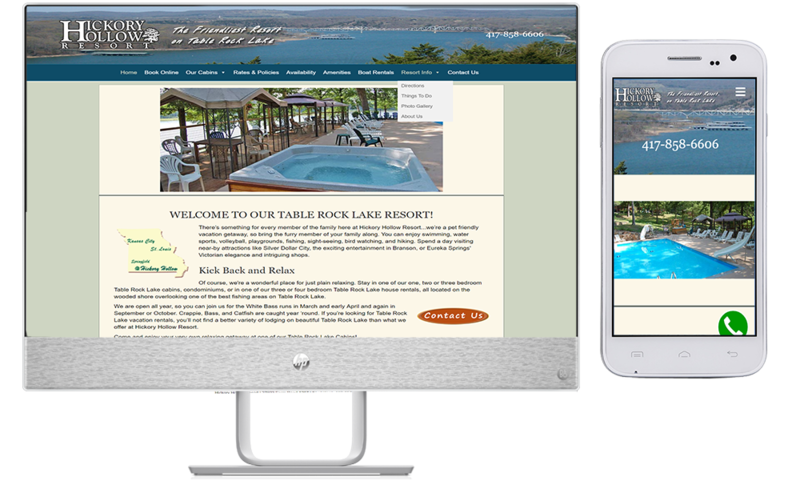 But lake resorts are highly competitive, and the site needed to rank better to draw new customers. The addition of an online reservations module immediately increased reservations. We adjust rates in the module for the client as needed, and add new photos as they provides them to us. Despite the very competitive market, rankings have continued to climb, website traffic continues to grow, and their occupancy rate is growing as well.